We at Baytown Landscaping & Construction are a leading company in the field that provides excellent landscape design and build solutions. We are highly focused in our approach and make sure that we exceed customer expectations in every job we take up. 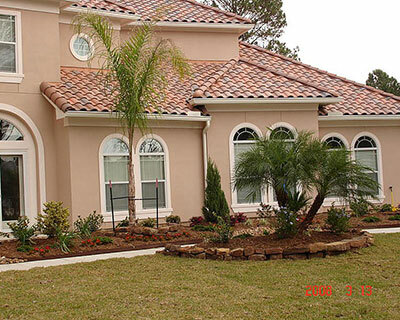 We provide customized landscape design and construction solutions. As part of these services we handle everything from hardscaping and softscaping design and planning to the actual installation of all these features. Our team can design and plan patios and decks, driveways, walkways and pathways. We handle paver installation to perfection and build specially engineered retaining walls as well. While the design and installation of the landscape needs to be done well, it is even more important to make sure that all of the outdoor spaces are maintained with regularity. This regular attention can help keep the hardscapes and softscapes on your residential landscape in the best condition. The right type of irrigation is very important regardless of the size of your landscape. If you have plants, trees and lawns on your property, they would require watering at the right times and schedules. When we are designing your landscape, we also include comprehensive irrigation designs and plans that cater to the specific needs of your outdoor spaces. Hardscapes are a very important aspect of your residential landscape. The masonry elements provide support to various other features that would be installed there. We offer customized hardscape design and installation services. As part of theses olutions, we can provide patio and decks, driveways, walkways, pathways, retaining walls and more. The outdoor spaces of your property can provide a good return on investment if they are designed and planned well. As a full-service landscape company, we provide excellent outdoor living solutions and can design and plan patios, decks, poolscapes and more. Our team of experts also provides excellent fireplace and fire pit design and can plan rock waterfalls, ponds or streams as well. Having beautiful outdoor spaces is a lot about ensuring that you also get the right kind of exterior lighting installed. That is the only way you would be able to use the yard areas in an optimal way even after dark. As part of our overall landscape design and planning solutions, we offer excellent outdoor lighting services. Installing water features in the outdoor areas of your home is one of the best ways to make sure that these spaces have a well-balanced appearance. We provide customized water feature design and installation services. Our team can plan water features such as ponds, waterfalls, fountains as well as streams etc. The trees on your property add to its beauty. They lend shade, help improve the quality of air in your immediate surroundings and improve the appeal of your home. Tree maintenance is a very important aspect of any landscape care plan. We provide excellent tree services which include tree trimming and pruning, tree removal, stump grinding, pest control and more. If you are looking for customized landscape design and installation services, you are at the right place. For any more information related to our services, or to discuss your project details, feel free to contact Baytown Landscaping & Construction at this number- 281-851-8684. You can also send us these details through this Contact Us form and we will revert within the shortest possible time.